The coastlines of Bangladesh are constantly moving. Surveys, based on satellite images, have shown that each year there is a net accretion of around 20 km2: newly formed land of about 52 km2 minus eroded land of around 32 km2. With an assumed density of 800 people per km2, this means that each year approximately 26,000 people lose their land. For many of them, the newly accreted land, or chars, as these new-emerged lands are called in Bangla, offers an alternative home. 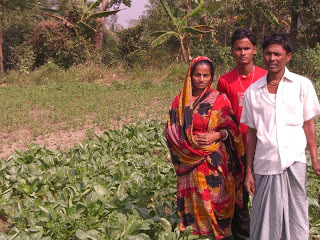 The Char Development and Settlement Project IV (CDSP IV), jointly funded by the Government of Bangladesh, IFAD and the Government of the Netherlands, works to support the women and men to build their lives on this new land. “The living conditions on the chars are harsh,” explained D. K. Chowdhury, who works as the technical advisor on land settlement for CDSP IV. “The land is completely inaccessible and can only be reached by boat and foot. The people living there are exposed to nature and due to the daily tides, the land gets flooded on a regular basis. There is no safe drinking water, no health service or sanitation, no agricultural inputs, no education, no legal or social structures. Since its first phase (1994-1999), CDSP has been working to support the rural women and men occupying land on the chars to receive legal titles for these plots. The first step of this process is the production of a settlement map. During a plot-to-plot-survey (PTPS), cartographers, measure each and every plot, draw an exact map of the land by cadastral surveys and note the details on the inhabitants. The maps and the information about the families are then deposited in the Upazila [subdistrict] Land Office. Land settlement to the landless household are conducted by the government’s land offices according to the provisions of the Agricultural Khas Land Management and Settlement Act. In the CDSP areas, the result of the PTPS has to be published by the Upazila Land Offices and complaints against the findings can be submitted within 30 days. “In normal land settlement processes, people have to travel 30 to 40 km to the Upazila Land Office to look into the files. Under the CDSP system, public hearings are held at the village level. During these hearings, each case is called out to confirm that the family and all listed members are living on the plot. During this process other participants can object, for example if they know that an applicant owns a plot of land somewhere else, it can be mentioned to the hearing personnel. After all, only landless households are entitled to a khas land settlement. 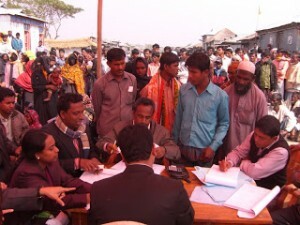 Once the hearing is concluded, the list with the identified landless households is transferred to the Upazila Land Office which prepares the official resolution of the meeting as well as the settlement record for every family, which then has to sign the Kabuliat (deed of agreement) by both the selected landless households and the land authority. Under CDSP, the deed is registered the village level due to a special arrangement (in other cases these are done at the Upazila Offices) , which saves the families time and costs for the often difficult travel to the Upazila Office. Once registered, the details of the settlement cases are entered in the land database of the CDSP. The project has developed a Land Records Management System (LRMS), which allows keeping record of every land attribution and helps preservation of the permanent records and preventing double assignments. The LRMS produces computerized Khatians (final records of right) and finally this document is handed over to the beneficiar, making them the owner of the respective plot on a permanent base, meaning that it cannot be sold. “Another thing that CDSP has introduced to the process, is that the wife’s name is written first in the legal document,” D. K. Chowdhury said. 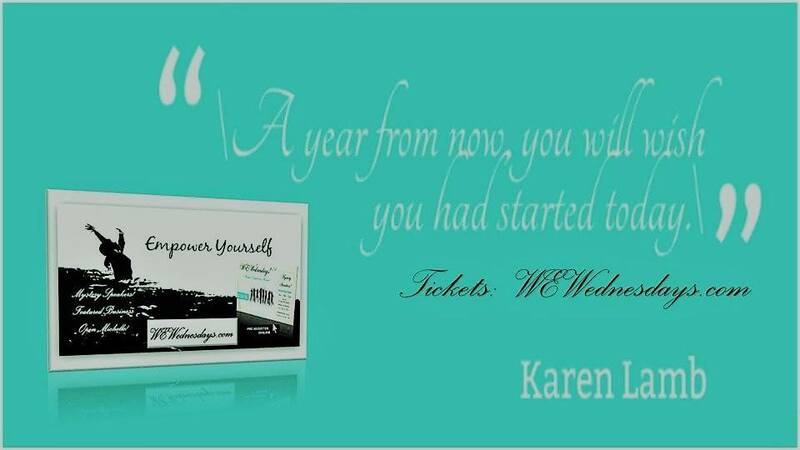 “As a result, the wife is legally entitled to 50 per cent of the total land. This strengthens her position in the family and gives her uninterrupted access to the land and a legal position for the women in many decision making processes, for example if the family wants to use the land as a collateral for credit, selection of crops for cultivation, etc. When we visited Caring Char (one of the five chars being developed under CDSP IV) last week, we met one of the 3 teams currently conducting the PTPS. Using traditional cadastral survey methods to draw an exact maps on different segments of the 12,000 ha large char, they had just started to measure the plot of Nayan Begum, who came to Caring Char 7 years ago with her husband and children from Hatiya, a close by island. They bought a share of land from a man who had occupied a plot and even though they paid for the land they’re now living on, it doesn’t belong to them in the legal sense. So they decided to move to Boyer Char, where they bought some land from Bahini. The plot they received, was jungle land and not yet suitable for agriculture. They left the children with relatives; during the day, her husband would sell the wood they found on the plot and she would work as agricultural laborer for other farmers. During the night hours, they cleaned the land. CDSP IV is applying an integrated development approach, to improve the economic situation and living conditions on the Chars. 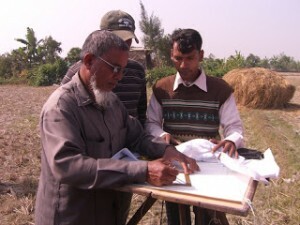 In addition to the land rights activities, six implementing agencies, four NGOs and a technical assistance team work closely together to strengthen protection from climate change, build climate resilient infrastructure, provide livelihood support, such as health services and legal education, and support the establishment of field-level institutions. The current phase of the project is running until 2017 and is expected to directly benefit 28,000 households. 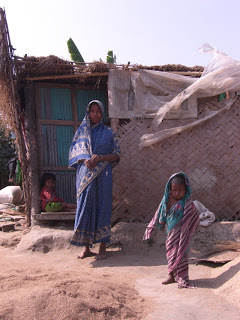 Filed Under: ASIA, Uncategorized, WORLD ISSUES Tagged With: A Celebration of Women, Aleyuna Bala Das, Bahini, Bangledesh, children, farmers, Government of Bangladesh, homes, IFAD, Living on new land: Char Development, Settlement Project IV, The Char Development, Upazila Land Office, women.